Glazed carrots are a simple and elegant side dish that will shine at the table. Tender carrots tossed in a maple butter sauce with lemon zest and parsley. Oh yay! Glazed carrots are a super easy recipe made in just 15 minutes! Carrots are a favorite root vegetable loaded with nutrients like beta-carotene (which makes the flesh bright orange), fiber, antioxidants, vitamin K, and potassium. A combination of simple ingredients like maple syrup, butter, lemon, and parsley make this side dish shine. These cooked carrots will disappear in minutes because the lightly sweet elements make for tasty bites. I bet this will be your new favorite vegetable to prepare for any occasion! There’s something therapeutic about chopping vegetables. It reminds me of practicing my knife cuts in culinary school. The carrots are cut in a sizeable bâtonnet stick size, about 1/2-inch wide and 2-inch long pieces. Don’t worry if the cut pieces aren’t all even lengths. I’d rather you end up with more yield of vegetables to enjoy, than throwing away perfectly good carrots. The carrots get a quick blanch in hot boiling water to soften the cell walls of the vegetables. I’ve also found that the natural sweetness of the carrots is intensified when cooked. The carrots should be fork tender but still hold there shape since it will be stirred with the glaze. You want a nice bite and chew, but not be raw and crunchy. Baby carrots like the snack size or the ones with the green tops still on can be used. Just adjust the cooking time as needed because they tend to be larger and require more cook time. 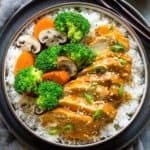 Let’s talk about the glaze! Butter, lemon juice, and pure maple syrup are simmered until hot and bubbly. The sauce will start to reduce, and the sugars will caramelize to create a coating that clings to the carrots. Any sweetener can be used like light or dark brown sugar, honey, coconut sugar or granulated sugar. They each have their unique flavor profile. I like maple syrup for it’s earthy and caramel notes. Just a thought, if you’ve got some homemade ghee to substitute for butter that would add butterscotch flavors, plus its Whole30 and Paleo diet friendly. The glazed carrots get a sprinkle with fresh lemon zest to add a nice citrus aroma, along with Italian parsley to make the colors pop. Simple, easy and addicting. Kids and adults will love this side dish all year long! Did you know that adding a little bit of acid to a dish can enhance the natural flavors of foods? Using just a little bit of vinegar, lemon juice or lime juice contains acids that can heighten the flavor of the sweet and salty taste, so you don’t have to add as much. Plus, it balances the overall flavor of the dish. A little goes a long way so use sparingly! Glazed carrots are a simple and elegant side dish that will shine at the table. Tender carrots tossed in a maple butter sauce with lemon zest and parsley. Wash, peel and cut carrots into 2-inch long pieces, and 1/2 inch wide sticks. Add the water to a medium-sized saucepan. Bring water to a boil and add 1 teaspoon salt, stir to combine. Add carrots to boiling water. Cook until carrots are tender and hold its shape, 5 to 6 minutes. Drain carrots. In a medium-sized pan add the butter, lemon juice, and maple syrup. Heat the pan over medium heat and melt the butter. Once the sauce is bubbling add the carrots. Gently stir the carrots and the sauce to combine. Cook stirring occasionally until the carrots are glazed with the thickened sauce, about 4 to 5 minutes. Season carrots with 1/4 teaspoon salt and 1/4 teaspoon pepper, stir to combine. 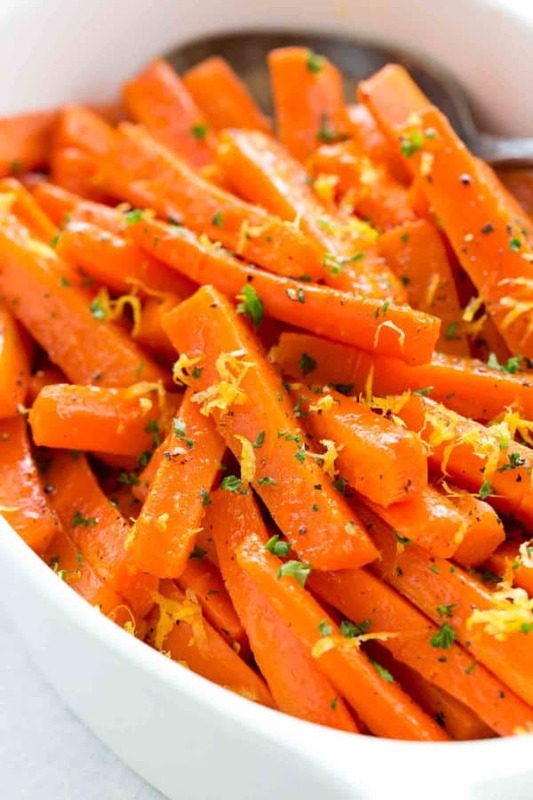 Transfer carrots to a serving plate and garnish with lemon zest and parsley. MAKE IT PALEO: Use ghee or olive oil instead of butter. MAKE IT WHOLE30: Reduce 1/4 cup of fresh orange juice to 1 tablespoon over medium-high heat, and then add ghee or olive oil and lemon juice. Add carrots and cook until sauce glazes the vegetables. Use sea salt instead of kosher salt. MAKE IT VEGAN: Substitute olive oil for butter. Yummy. I could make a meal of these Jessica.